The silicones in Ultra Skin's formulation create an optical blurring effect that diminishes the look of fine lines and wrinkles, creating the illusion of a smoother, more uniform skin with a unique satin finish. The oil-free formula hydrates skin and does not require powder for setting. The SPF-free formula allows you to choose the best suncreen for your skin but remember that SPF products will flash white. More importantly, SPF isn’t effective in cosmetics. We urge you to find a good sunscreen and use as directed. Read more about SPF. The silicones in the formula ensure a long lasting, moisture, heat and oil-resistant finish that doesn’t crack, settle or fade. The silicone molecule is bigger than human pore, enabling it to float on the skin without settling into pores, fine lines or wrinkles. It also has soft focus properties that create optical blurring, diminishing the appearance of fine lines and gives the illusion of smoother, more uniform skin. Ultra Skin performs well in any weather, from stifling humidity to cold, dry winter conditions. Dermatologists report that a silicone-based foundation is ideal if you suffer from rosacea, in part because of the silicone in the formula creates skin-barrier protection. Silicone's large molecules prevent it from being absorbed by the skin. In addition, Ultra Skin's undertones will cancel out much of the red caused by rosacea or other skin conditions. Read more about the benefits of silicone. We always recommend using a Foundation brush to ensure smooth and hygienic application, but thanks to Ultra Skin's unique, user-friendly formula and pump applicator, fingers are allowed. Regardless of how you apply it, use sparingly as a little goes a long way! Start in the T-zone and work your way out, patting it onto the skin – no long swipes. The pros call this “stippling.” Reapply for more coverage as needed. Don't automatically reach for the powder after applying Ultra Skin. It sets by itself to a flawless, satin finish. If you powder, do so sparingly as too much will accentuate skin imperfections as well as fine lines and wrinkles. It is possible to over-moisturize skin before makeup application. Face Finish is the perfect way to hydrate without slip. The natural cucumber extract in the formula also reduces puffinesss and redness. Use it after makeup is done to preserve and throughout the day if your skin feels dry. 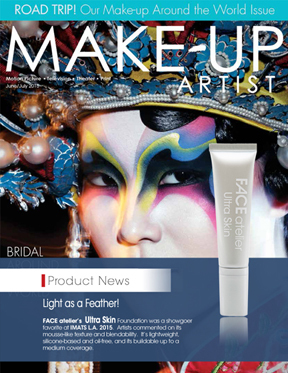 Undetectable Face Finish hydrates your skin and revives your makeup without buildup. BRIDAL ALERT - Ultra Skin's long-lasting satin finish will ensure that you're picture perfect and camera ready all day and night long. It's impervious to tears - no streaking! PRO ALERT - SPF-free Ultra Skin delivers a flawless, HD-friendly satin finish. It's a brilliant performer in all setting and climates. And it blends beautifully with Ultra Foundation.